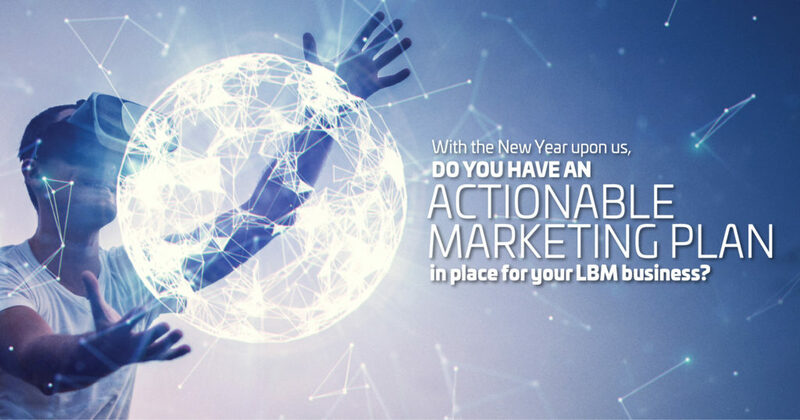 Impact 180 » Blog Archive » With the New Year upon us, do you have an Actionable Marketing Plan in place? We hear all the time from LBM dealers that they struggle with marketing planning. For many, they just need some help in developing an actionable plan. For others, it appears the focus is on marketing tactics verses marketing strategy. Most successful marketers have a process to develop well-grounded strategies to make strategic decisions. I like to think of strategies as the sequence of events necessary in order to produce the desired outcome. Strategies are broad and should provide direction for all areas of your plan. Tactics on the other hand, are the actual means used to execute your strategies in order to achieve your business goals. What are your growth objectives for the business in 2019 and beyond? What would it take to get the business to the next level? Are you able to describe your growth strategy (e.g. new customers, new channels, taking share from a competitor, new products, growing your footprint)? What are the biggest challenges your LBM business is facing? What are the biggest opportunities to grow the business? Is this consistent with your current approach or are you planning any broad changes? What does your business pipeline look like? Can you describe your target customer (s)? Do you know what their business challenges are; do you know their goals for next year and how you can help? What is your value proposition and is it resonating with your customers/prospects? If not, what recommendations for improvement do you have? Keep in mind that customers expect a seamless experience no matter how they choose to interact with your business. Who are you mostly competing against and how are you differentiating your business to stand out from the competition? What has been the most effective in helping to generate new opportunities in your market/channel? How can you best reach customers and prospects going forward (e.g. print, email, social media, newsletter, website, PR, events, referral, etc.)? What is the best way to demon­strate your products/services and how could that positively impact your business? What types of support are needed from marketing to help achieve your business goals? How will you set your marketing budget? Most lumber yards use ½% to 1.0% of sales. Are there outside resources that could help develop and execute some of your plan? How will you measure the marketing results of your plan? What metrics are important? While this list is not meant to be all inclusive, having answers to these types of questions can enable the development and implementation of a comprehensive marketing strategy, while mitigating your business risk. I try to simplify things when whenever I can, so the most import question I always try to answer: If you can do one thing that would have the biggest impact on your business next year what would it be? The answer is probably a great place to start.